I gave a sneak peak at my new curtains in my DIY Decorating post, and now the time has come to divulge just how I made those ruffly window dressings! I was originally inspired by the curtains in this post. I later realized that those curtains were made from pre-ruffled fabric, but by that point I’d already started making my own. Ruffles are fun to make anyway! 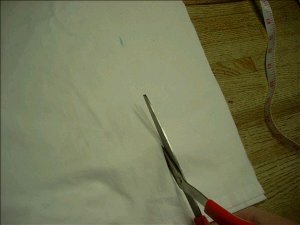 Step 1: I used thrifted, white flat sheets for the fabric. 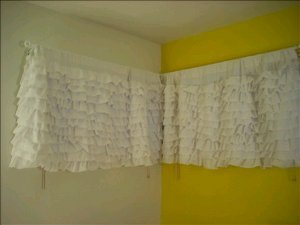 One sheet was for the curtains themselves, and the other was for the ruffles. 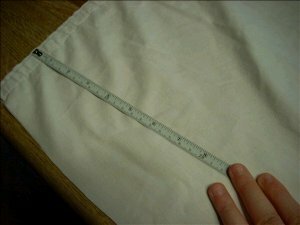 I started by measuring and cutting the curtain bases, finishing the edges, and sewing a loop for the curtain rod to go through. Step 2: Next I cut strips of fabric from my other sheet. 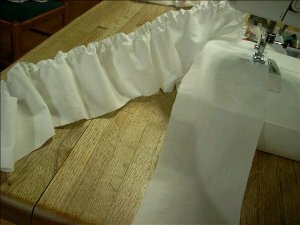 A good rule of thumb when sewing ruffles to something is to cut the fabric to be ruffled twice the length of the fabric it will be sewn to. This, of course, depends on just how ruffly you like your ruffles to be. My ruffles were four inches wide, but the width is also up to you. Step 3: Make those strips into ruffles by sewing a basting stitch along one end and pulling the loose threads. As always when gathering fabric, don’t backstitch! 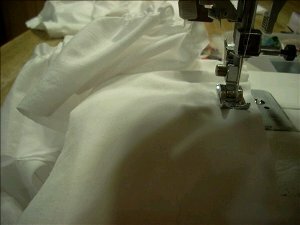 You can also use this trick I learned to make ruffling even easier: Set your machine to the longest stitch with the highest tension on the top thread, and watch your fabric ruffle itself (be careful that the thread doesn’t snap, though). 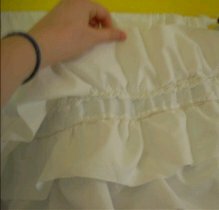 Step 4: Pin your ruffles to the curtain base that you already made in step 1. 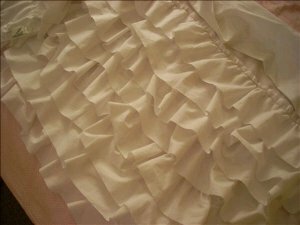 I started at the bottom and pinned my first ruffle along the bottom edge of the curtain. 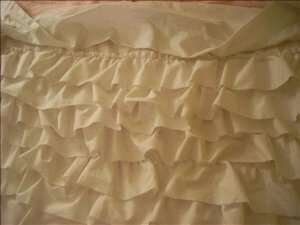 The next row of ruffles goes just above that, but make sure the bottom of the second ruffle overlaps the top of the ruffle below it, so that the messy edges don’t show. Step 5: Keep adding ruffles until the entire curtain base is covered in them, then stitch them all down. 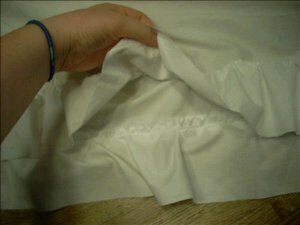 Don’t forget to turn your machine tension and stitch length down when you sew the ruffles onto the curtains. 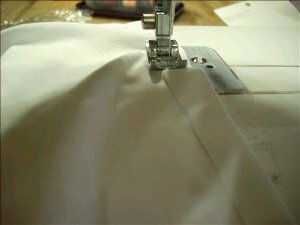 You might find it easier to alternate stitching and sewing, or you may want to do this project assembly-line style and pin them all before you start sewing. 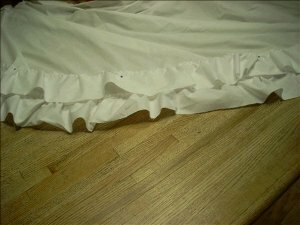 Step 6: For the very last ruffle (the one at the top of your curtain base, closest to the curtain rod), sew the ruffle upside down, then flip it over to that its bad edge is hidden. When you’re done with this, hang those curtains up! We’ve got lots more sewing projects for your home on FaveCrafts! 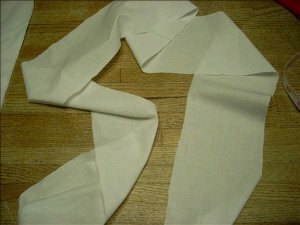 And don’t forget to check out our brand new sister site, AllFreeSewing.com!